WHAT THE INVENTOR SAYS: It has already been proven that distance does not affect the wireless transmission by the Hertzian wave. My telephone messages from fifty feet to seven miles are a further demonstration of this fact. The first application of my wireless telephone will be for marine service. Wireless telegraphy has been used commercially on about 250 ships up to date. As my telephone will work as far as any wireless telegraph instrument after some development I intend to apply it for the same service. In time of war, every battleship fitted with a wireless telephone will be able to get any particular ship within its range without the danger of messages being intercepted. An ordinary wireless telegraph instrument requires an operator. By using my telephone the officer in command could carry on the conversation personally. In a great many cases my wireless telephone could be better adopted than the ordinary wire telephone. For instance, no person desiring an absolutely secret telephone communication between Oakland and San Francisco would have to go to a tremendous expense to secure it. At a nominal expenditure of money two wireless telephone stations could be erected and maintained, assuring absolutely secret and uninterrupted communication between these two points. The field of my wireless telephone is greater than that of the wire telephone, in view of the fact that it can be used in isolated places. The following is a summary of the uses to which my telephone will be applied: Marine service, lumber camps, mines, ferry-boats, lighthouses, mountainous districts, desert lands, balloons and our future air ships; in fact, in all places where it is either impossible or too expensive to apply the ordinary telephone. PERHAPS when the subject of child culture shall receive the same expert attention that Luther Burbank gives to his experiments in the plant world it will be possible to know just what powers and possibilities every one may have. Certain characteristics will be cultivated and even the physical features will be under control. We shall develop scientists, artists, inventors, laborers, as a matter of course, and no one will be surprised at another's gifts. But until this time comes--and it is still far in the future, isn't it--we shall not be able to contemplate splendid achievements without enthusiasm, and any one who by a great invention or a long-sought discovery lightens the burdens of the world's workers will be received with loud acclaim. Not so often are we called upon to acknowledge such obligation for one of the least among us, the children, and that is why I rejoiced at the opportunity of meeting the subject of this sketch, Francis J. McCarty, inventor of a system of wireless telephony. That he, a boy of fourteen, should have discovered the secret of transmitting the tones of the human voice over long distances without the use of wires, in the face of statements from most of the scientists who had considered the problem and pronounced it impossible of solution, puts him in a place apart. He is not to be judged by ordinary standards, for whether the scheme was evolved by accident or as the result of close study, he has put the world in the way of still further annihilating its limitations of time and space, and all the world is his debtor. Do you wonder what manner of boy he is, this youthful inventor? Three years have passed since he had his firm proof that the Hertzian waves will carry the sound of the voice as well as inarticulate impulses, and he has grown into a tall, slender youth of seventeen. Quiet of manner and direct of speech, he is a type of the vigorous American boyhood with which we are all acquainted and upon which we are depending for our great work of the future. Not until he begins to talk upon the subject of wireless telegraph and telephone does he appear to differ from any one of a hundred young men we know, but then his voice takes on a new tone he speaks as one having authority. "People think," says this student of the new use for electric power, "that only recently has there been any attention given to the invention of a wireless telephone, but that is not true. More than forty years ago Morse had a plan for communicating without direct connection, and though he used three or four times as much wire as would have been needed for the other system, which made it impractical for commercial purposes, he proved that with only the ether as a medium vocal tones could be transmitted." He continues to talk of the early investigators, and I learn of Lindsay, a Scotchman, who had definite theories of both wireless telephone and telegraph systems, a generation ago, and who is also reported to have studied the problem of electric light. He was pitiably poor, however, often going without food in order to buy some piece of apparatus required in his experiments, and was unable to bring his work to completion. The discoveries of Hertz, the great German, are discussed with enthusiasm, and we pass on to the achievements of Popoff, who demonstrated before the Russian Research Society, ten years ago, a wireless telegraphy equipment that was satisfactory under limited tests. What a pleasure it is to listen to his clear concise statements! With what a complete absence of self-consciousness are his opinions and facts delivered! This is no precocious youth, who, having stumbled upon an important discovery, preens himself upon his distinction. He is an investigator by virtue of his temperamental fitness and we may reasonably expect from him other valuable contributions as his experience widens. Quite naturally, too, does he assume the teacher's attitude and his illustrations--homely examples to illustrate principles that are elemental to himself, but unknown to me, are both simple and apt. I have only it close my eyes to imagine myself in the presence of a distinguished savant, some man of mature years who has had the benefit of long study and acquaintance with the trend of modern thought along this line. "But," I interpose, "I want to know what you have done. Tell me about yourself." At once he is again the easy, careless boy. I'm afraid there isn't anything very interesting to say about myself," he observes, "because I've always done just about what the other boys did." But he has done some things the other boys never dreamed of trying; he has done something that many men, "children of a larger growth," have sought to do without success. That is why he interests us, and so I tell him. He cannot understand it, but, being good natured, he yields the point and continues his story. "I had to leave school when I was twelve. I was always interested in mechanical problems, you know, and in looking for work I wanted something in that line. First with the telephone company and later with an electrical supply company, I found plenty to keep me busy. "When I was fourteen, I went into the electrical contracting business for myself, but I soon gave it up, for I discovered my principle of the wireless telephone and work on that has taken all my time ever since. "I used to do the repairing and readjusting of the wireless telegraph apparatus that was being demonstrated here, but had to give up even that because I needed all my days for my own work." "How did you learn all the history of the work. Surely that matter is not part of the regular school course for children under twelve!" It has been some time since I left the public school and I am accustomed to surprise at the scope of the present curriculm for very young children, but this seemed most astounding. "Oh, no, indeed! You see, I'm always reading about this kind of work whenever I find in a book or magazine any report of some man's experiment with a diagram the apparatus with which he made his tests, I set right at building a duplicate to see if I can get the same results. You really can't understand the problem and the way he worked it out unless you do this." I immediately decide that if genius has been correctly defined as "an infinite capacity for taking pains," Francis J. McCarty has fully established his right to the title of Genius. Think of the spirit of thoroughness that compelled him to not be satisfied with the experimenter's deductions until he had contrived a similar apparatus of his own and arrived at similar conclusions. "I had been working for the wireless telegraph company," continues the young apostle of importance of being definite, "and it seemed to me that since we could send the wave signals without direct connection we should be able to send exact tones. They said this could not be done because the rate of vibration of the human voice was so much lower than of the Hertzian wave, but I was not convinced. If we could only have the right transmitting instrument I thought it could be done, and I kept on trying. Finally, I struck the right plan. "The first telephone outfit I made was very small and crude. The transmitting instrument was in the front of the house and the receiving on the porch in the rear. The aerial wires were suspended on posts not over five or six feet high and the ground plates were laid on the floor. It worked all right over a distance of about fifty feet and anything that was said, even in a very low voice and with the intermediate doors closed, could be heard plainly. "Then we tried it over a distance of 750 feet, and then between Oakland and San Francisco, and the longest test we have made to date was between San Mateo and Millbrae, seven miles and a half. In every case it was satisfactory. "Of course, we haven't carried on any conversation, for I've had only the use of one set of instruments, but when I can talk or sing or whistle into the transmitter and can be heard perfectly seven miles and a half away, that proves that the plan is right, doesn't it?" And I admit that it certainly does. "Are you superstitious?" he inquires with seeming irrelevance. Now, I am superstitious--a very, very little. Just enough, in fact, to make me reasonably careful to see that, by all outward signs, the fates are propitiously disposed toward any new undertaking. But I do not like to admit even that, so I parry this question with another, "Why?" "It is about the number 13, which has played a very prominent part in my investigations. Some of the tests have been made on that day of the month--the San Mateo one, for example, on the thirteenth of June--and when it is not the thirteenth, it is Friday that haunts me. I don't plan to make it come out so, you understand. It just happens." We agree that "unlucky" days have not apparently hindered his progress and he says, with a boyish laugh, "When I remember what a struggle Lindsay had, starving himself and even then not being able to carry out his tests, I think I've been pretty fortunate." A peculiar ring at the door--rather a succession of rings--wakes the echoes and in response to my questioning look I am told, that it is "some one of the boys. They always ring my initials according to the telegraphic code." The boyish chums are as important a part of his life as ever. A short time ago they were playmates. They sympathized with the early disappointments in his work and now share his elation over the final outcome. In a word, they "belong." * * * I am curious to know how he has secured his instruments, whether he has had help in their constructing. "The making of the apparatus has been my problem and I have had no help in its solution. Some of the parts needed cannot be found in San Francisco, so I have had to design and make them myself, and as I am not naturally mechanical in that way it has been very difficult. The receiving apparatus is very simple and easily secured. It is the transmitting instrument--my patented feature--that offers the difficulties. You see, I can't give any electrician a detailed drawing with specifications as to what I want; not just yet. That would be giving away my secret, but when I can go to New York, as I hope to in another month, and secure precisely the apparatus I ought to have you will see some splendid demonstrations of wireless telephony. Then I will file the final papers at the Patent Office and will arrange for foreign patents, too." "Doesn't it seem a wonderful thing--this invention that is to be covered by patents here and abroad, and that may become as familiar as the telegraph or the present telephone?" With all his heart he answers. "It is splendid! And the cost of installing will be so little, with cost of maintenance nothing, that the central offices can give the service very cheaply indeed. There will be no franchises, no wire-and-pole privileges to pay for. It is beautifully simple." "The profits from similar inventions, in the past, have been enormous," is my suggestion. "Yes, I know, but that is not the important thing, is it? The biggest and best part is the working out of the idea and proving that it is correct." There spoke the genuine enthusiast. He has devoted himself to proving whether the experiments of others were correct and true and now taking precedence over all other considerations is the necessity of proving that his own discovery, his original theory is commercially practicable. The thought of the money to be made holds second place. "I would not have you believe," he adds quickly, "that I set no store at all by the property rights of my invention. One reason I am so interested in protecting myself by European patents before pushing the work here is that I do not want to lose any proper benefit of what has been done. My grandfather had that misfortune more than once." "So you come of an ingenious family. Was your grandfather interested in electrical lines, too?" "He invented a number of important devices, but none of them exactly electrical. Perhaps the best known is the prismatic deadlight, by which basement rooms are lighted through the pavement. That was patented and afterward sold. His name, William Lynch, may be seen on some of these lights even to-day. 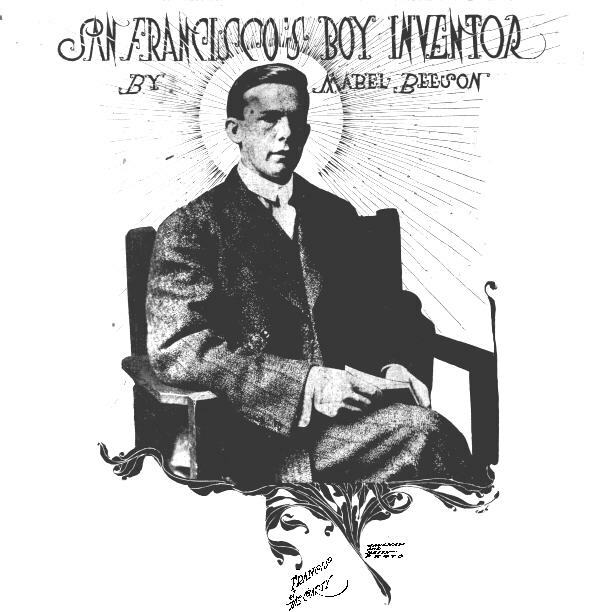 He was the only inventor I know of in the family, so we will say I have my knack from him." "When you do go East," I caution him, "do not become so pleased with New York as to be unwilling to come home." "As if there were any such danger," he laughs. "California is the place for me. It is my State and I want California to have all the credit for whatever I may do." There could be no more final proof of the emancipation of our young people than the experience of this youthful scientist. The day that ruled "Children should be seen and not heard" is of the long, long ago, and no one is found regret its passing. In this year of grace, any one with a serious message can command the world's attention. For the man or woman, boy or girl, who knocks at our doors, seeking to interest us in a new thought or a new invention, there are only two questions: Is it needed? and Are you in earnest? If the scheme be found to contain new elements of truth, its creator becomes our benefactor and all the world has need of him. Probably no one does as much valuable service as he who finds new methods of transmitting knowledge and intelligence. We may not know all the corners of the earth, face to face, but we demand increasingly detailed information of their happenings. We must know each day what the people of all nations are doing and planning. Like Ajax of old, we breathe an unceasing, earnest prayer for light; no country is too remote for our interest and no plan of communication that brings us closer together can escape a cordial welcome.